A pair of handmade pottery lamps, although slightly lopsided, constituted one of my first home furnishings purchases many years ago. Intuitively, I have always responded to the handmade and the imperfect in design. But through the years I’ve wasted a lot of energy carrying the weight of perfectionism as it applies to myself: fashioning non-competitive situations into competitions, berating myself for making mistakes, worrying about my appearance. In the past couple of years, I’ve done just enough reading about the Japanese concept of wabi-sabi to get the gist of it. It’s about rustic simplicity, authenticity, and the belief that less is more. It’s about being willing to accept things as they are. It’s about noticing the beauty of unadorned and aging things. I am beginning to make peace with imperfection. As a woman of “a certain age”, shouldn’t I learn to revel in what Leonard Koren calls the “beauty of things imperfect, impermanent, and incomplete”? I’m not perfect; I’m not permanent; I’m not complete. 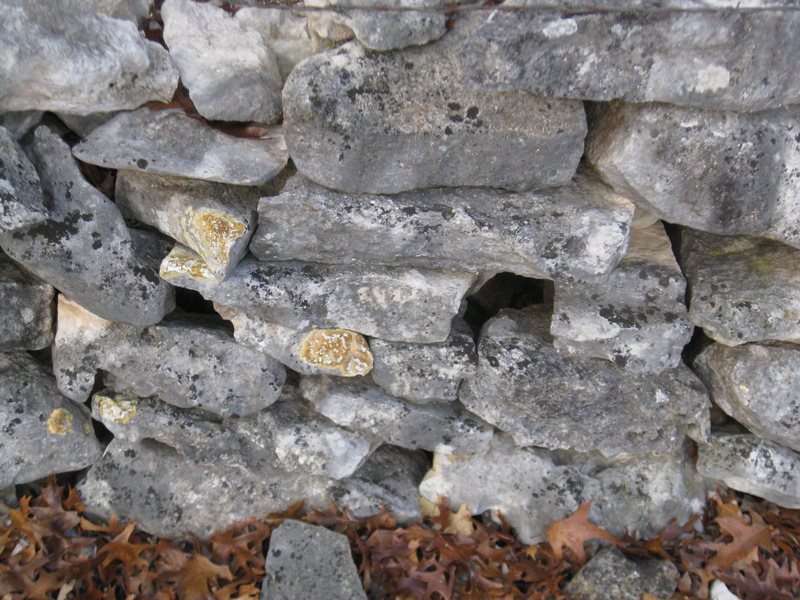 What makes this Texas hill country stone wall (pictured above and below) beautiful is its age and imperfection, thanks to more than a century of weather and lichen doing its work. 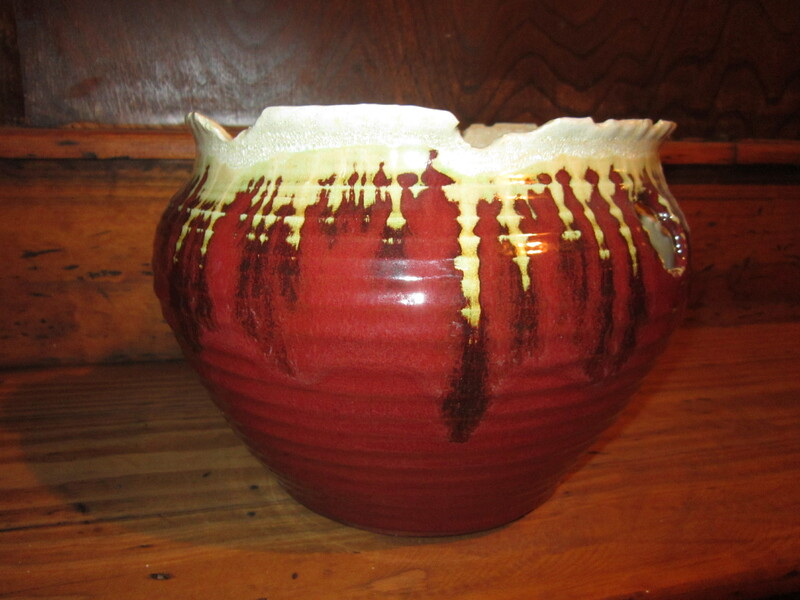 For me, an appealing feature of the hand-thrown bowl in the photo below, in addition to its rich red glaze and unique scalloped edge, is that it has been broken and put back together. It has survived. It remains useful. It brings joy to my day. It has no need to be perfect. What imperfect things appeal to you? Complete the following: I am beginning to make peace with . . . This entry was posted in awareness, happiness, Texas hill country, thankfulness. Bookmark the permalink. Chris, this may be my favorite post of all! I really love this blog. So glad you are home. Maybe we can talk this week. Thank you, dear writing friend and mentor. Yes, please, let’s talk: I can’t wait to see you! It’s wonderful to be home. I love the way you phrased this! The word “burnish” is really a wabi-sabi kind of term, if I have it right. It makes me think of the phrase that describes something as having developed a “patina with age.” That’s us! Hugs to you, Linda. I am beginning to make peace with…”wrong turns” and “dead ends,” realizing they really are opportunities to try again and discover new paths. Nothing is wasted! Anne, it really pleases me that you use the writing prompts! My wish is for this blog to be useful to writers, students, and teachers. Thanks for your steady support. Yes yes yes a must for a happy life, did you know that there is a thrift store in Moab called wabi sabi? Hi, Janet! Thanks for reading. I did know about the store’s name; maybe I ran across it online while googling “wabi-sabi.” I’ve been to Moab once but don’t think I went in the store. There’s a good website for those interested in learning more about the term called http://www.stillinthestream.com.